This booklet gives you the explanation and step-by-step of the Cosmic Inner Smile Practices with the benefits of the Inner Smile and the Practice that are supported by Inner Smile (Tao Yin, Lotus Meditation and Lotus Energy Meditation. There are 39 pages with over 30 color illustrations and images. The Inner Smile is a powerful internal healing and relaxation meditation. Deep relaxation dissolves physical and mental tensions that can cause energy blockages and unhealthy Chi. The Inner Smile enhances the energy of the organs and glands, our life force in general, and stills and focuses the heart and mind (Hsien). It makes us more aware of our body and inner being, because we learn to communicate with our organs, glands, spine and other specific parts of our body, as well as our soul. 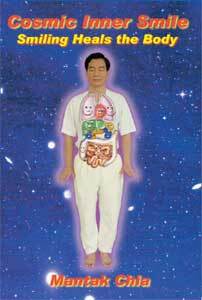 Taoist discovered that consciousness is rooted not only in the brain, but also in the vital organs and in a more subtle sense, in each of the cells. Smiling to the organs and thanking them for the work they do will reawaken the intelligence of the body. We are often so out of touch with the body and emotions that we do not notice inner disharmony developing until it finally manifest itself as a serious illness. You will learn how to generate your own love internally never needing any other love from others and your internal love will over flow to others. Practicing the Inner Smile daily lets us look inside to keep in touch with the state of our inner organs, our Chi, our breath and emotions. We can spot problems at their inception, making it easier to balance the emotions and virtues.